One of the best parts of summer is when fresh tomatoes start coming in from the garden. This past week has seen the first of our tomatoes and we were eager to sample them at the end of a long day of outdoor fun. Of course, another part of eating frugally (beyond the garden) is preparing meals in advance and in bulk. One thing my wife and I like to do is to make a huge batch of burritos, eat them for a meal, freeze the leftovers, and save the frozen ones for the future, thawing them individually for lunches down the road. Today, we’re going to do both. The source for the tomatoes is obvious (the garden) and the applesauce is 100% natural – literally ground-up apples, also easy enough. But what went into the making of those burritos? 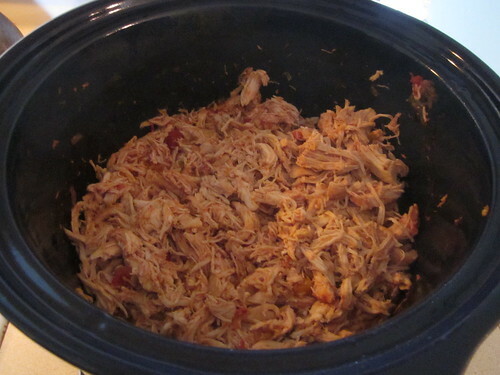 When we woke up that morning, we put three pounds of chicken into the crock pot. You can choose whatever chicken pieces you wish to include as long as they’re de-skinned and you’re willing to de-bone them after cooking. If you like all white meat, use breasts; we like a mix of pieces ourselves. Usually, we buy chicken in bulk when we find a sale on it, buying 15-20 pounds of various pieces, keeping them in the freezer, and using them slowly over time as we need them. This reduces the cost of each meal substantially. 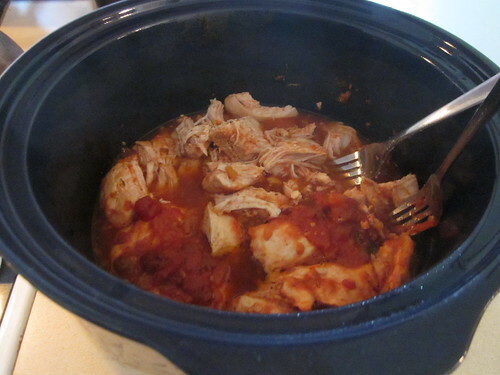 We literally put the chicken into a slow cooker, set it to “low,” and allowed it to cook all day (8 to 10 hours). In addition to the chicken, we also added three cups of fresh salsa and stirred it in with the meat. You can add any vegetables you like – we added a diced onion and a bit of leftover bell pepper, too. We spent the day having fun. 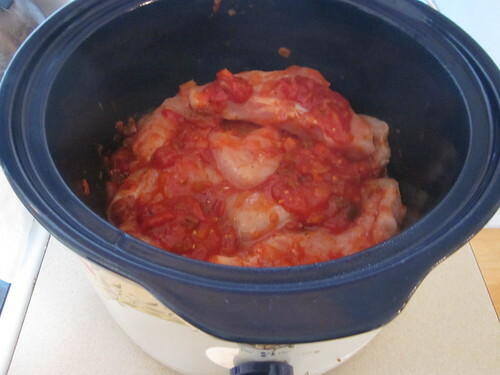 When we were in the house, the smell of the simmering chicken and salsa was delicious. At about five in the evening, we removed the lid from the crock pot and began the next step: shredding the now-cooked chicken. The shredding process is simple. Just take two forks, use one to hold a piece of chicken in place, and literally use the other to shred the chicken by sticking the chicken in the meat, then pulling the fork away from the stationery one, shredding the meat into small, uneven pieces as you pull. The big reason to do this is to increase the surface area of the meat, which allows it to sop up more of the delicious remaining salsa. 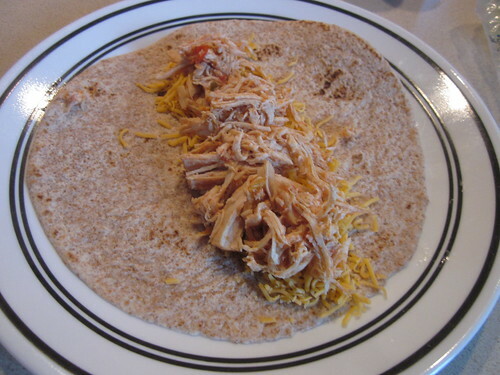 At this point, you have a bunch of moist, delicious-smelling cooked and shredded chicken soaked in salsa and with a lot of cooked vegetables around it. Time to start assembling burritos. The process is quite easy. Just take two or three tablespoons full of meat/salsa/vegetable mix from the crock pot and spread it across the center of a tortilla, like so. The above picture is a pretty chicken-heavy one, for example. You can also put a bit of cheese on them – or a lot, as you wish. Just use whatever type of shredded cheese you like. We used a sharp cheddar and used a healthy pinch of cheese on each one. We had three pounds of meat, plus all the salsa and vegetables, so we had a lot of mix to use. We stacked them high on one plate, then stacked them high on a second plate (the one originally used to shred the cheese). 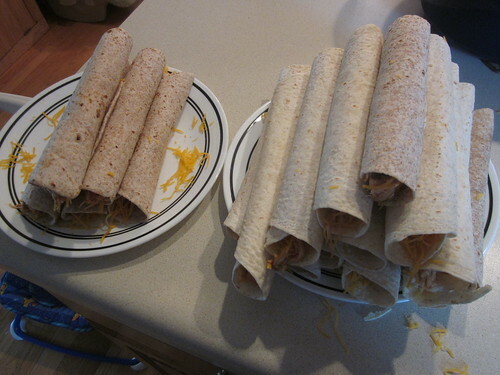 In all, we made twenty five burritos as depicted here. Some were wrapped in wheat tortillas, some in white – we simply used what we had purchased on sale and with coupons. Now, for a final touch – a bit of grilling. 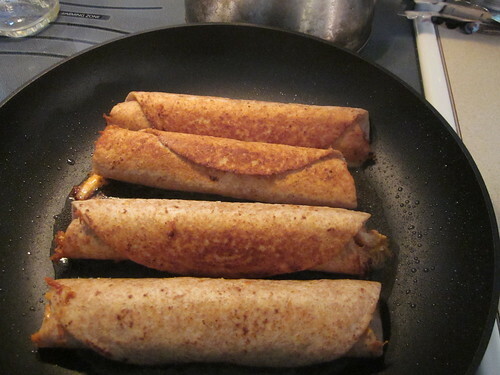 We just put a bit of canola oil in a skillet, just enough to coat the bottom and sizzle a bit on medium-high heat, then tossed in four burritos. With a spatula, we pressed down on the tops, then after a couple of minutes, we flipped them. We kept flipping them until both sides were a beautiful golden brown and the insides were nice and warm. Then we repeated until all the burritos were cooked. Six of the burritos went away at meal time, leaving us nineteen more for the freezer. We wrapped them individually, dated them, and put them into frozen storage, to someday be thawed and cooked for a delicious quick lunch. The cost per burrito? $0.30. 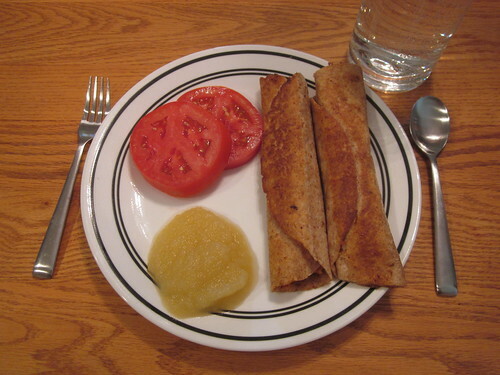 The fresh tomatoes were a sublime match to the burritos. We originally planned to have fresh strawberries as well (we have a bunch of everbearing strawberry plants this year), but our daughter ate the majority of the ones we’d picked and cleaned as an afternoon snack, so we broke out the applesauce as a vegetable accompaniment. Delicious, simple, quick, and cheap. What more could you want?